I just *love* this new set, Friends 24-7 from the Spring/Summer Idea Book & Catalog! I haven't had a chance to play along with this weeks CPS Sketch until today, but knew I had wanted to use this set, I was just waiting for it to arrive. I had already received the new Parisian Breeze Specialty DSP earlier in the week, and had my pieces all cut, just waiting to add my focal image from this beautiful set! The main images is stamped in Chocolate Chip on Vanilla card stock. I had wanted to stamp it on Watercolor paper, but just couldn't get a crisp enough image, and after several failed attempts I stuck with stamping the image on Vanilla, then added color using a Blender Pen and inks. I stamped the image a second time and layered it on the first stamped image using dimensionals. I used my Stamp-a-ma-jig and Chocolate Chip in to stamp the sentiment under my image. Sponged the edges with Chocolate Chip ink, then added some paper piercing with my Mat Pack. I tried various images and even some Baja Breeze card stock that I had run through my Texturz plate for my side panels, but in the end decided on another layer of Parisian Breeze DSP layered onto my Baja Breeze Panel, with accents of Baja Breeze card stock. Beautiful execution Lisa. This is one of my favorite stamp sets along with the matching wheel. And I really like this dsp as well. Between this dsp and and Bella Bleu dsp I'm not missing Le Jardin quite so much. I also like the way you turned the sketch sideways. I think you were right to layer the mats as you did and stick with the dsp as primary. The bird and the paper play off each other so well. 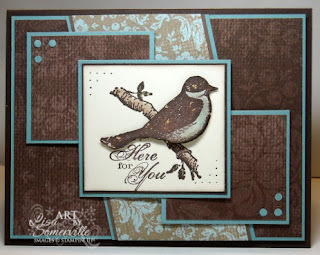 What a gorgeous card with this new set, Lisa! 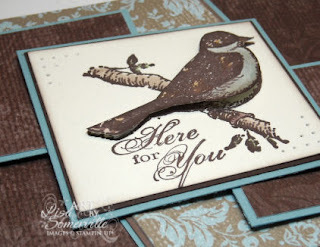 I love the layout and the 3-D bird! Lisa this is a terrific card. I love this new set also. Thanks for the inspiration. Wowzers-just gorgeous! The Baja Breeze frames everything beautifully and I really like how you lifted the bird with the dimensionals. You really rocked the sketch! TFS! Oh Lisa...this is SO GORGEOUS! I love these colors together and I love your design! Every time I see a new stamp set that you've introduced, I have to start recalculating my budget! I MUST have this one too! Your talent is AMAZING! Fabulous job Lisa! I love how the blue sets off the brown! Gorgeous card Lisa and love the layout. Those colors look so rich together! The Go-Divas pick this one! Love it!